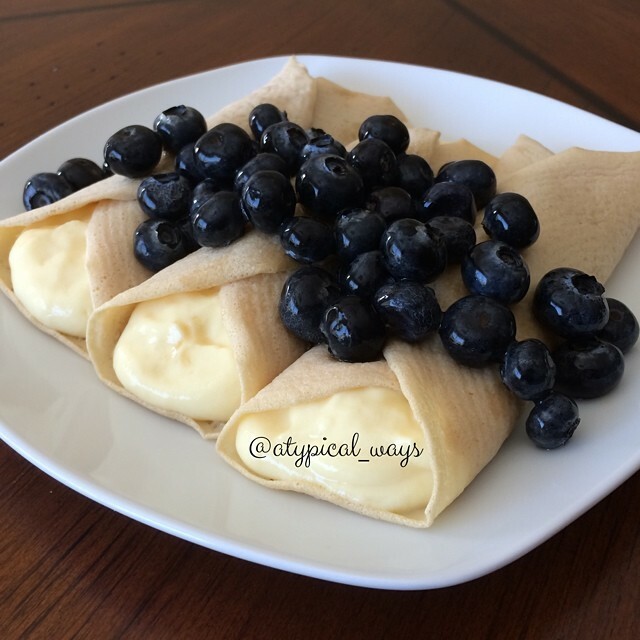 Blueberries & Cream Protein Crepes with only 310cal/28carb/5fat/37pro! First I mixed the pudding mix with 3 ounces of cold almond milk and placed it in the refrigerator to set. In my ninja blender I mixed the protein powder, 1 packet of stevia, vanilla extract, dash of cinnamon, 4 ounces of almond milk & egg whites. I preheated my skillet to low to medium low heat – I found that working with a low temperature was best as it allowed me to swirl & coat the pan with batter before it started cooking. In fact, I would hold the pan off the heat for 15 or so seconds before pouring batter in. Once I felt the pan was cool enough I would pour about 1/4 of cup into a small skillet and swirl around until the pan was coated with a thin layer. I would cook it until the edges started rolling in. I ended up flipping all of mine with my hands because I found it to be easier than trying to get a spatula under it. Once all of my crepes were made I took the pudding out, mixed the yogurt into it to really thicken it and then filled the crepes. I mixed the blueberries with 1tbsp of sugar free maple syrup and topped the crepes with them. Yum! « Strawberries & Vanilla Greek Yogurt in Dark Chocolate cups – perfect 150cal snack!